5th March 2018, New Delhi: The series of frauds that have come out in February 2018 at various branches of public sector banks have citizens raising concerns on various aspects of business-banker nexus and the gaps that exist. 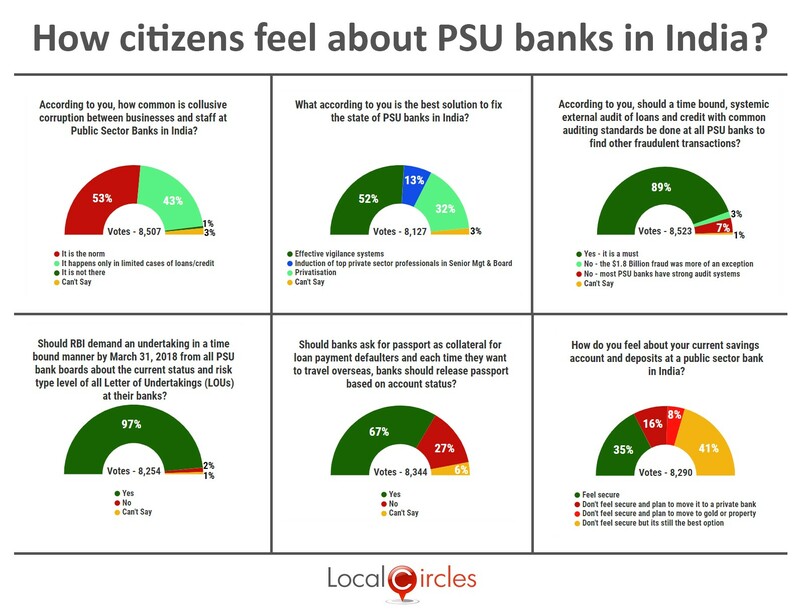 Middle class Indians have a very strong relationship with PSBs and there were lot of discussions on these banks on LocalCircles. To capture some of the zeitgeist we asked a range of questions about how people perceive PSBs. 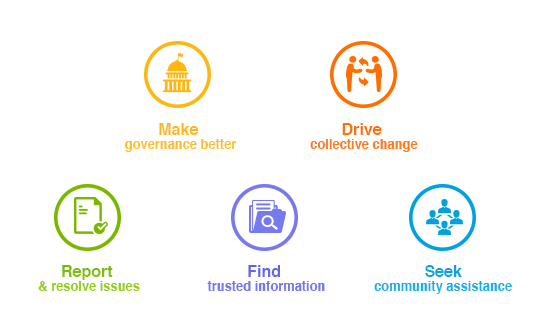 The survey received more than 50,000 votes and participation of over 20,000 unique citizens across India. 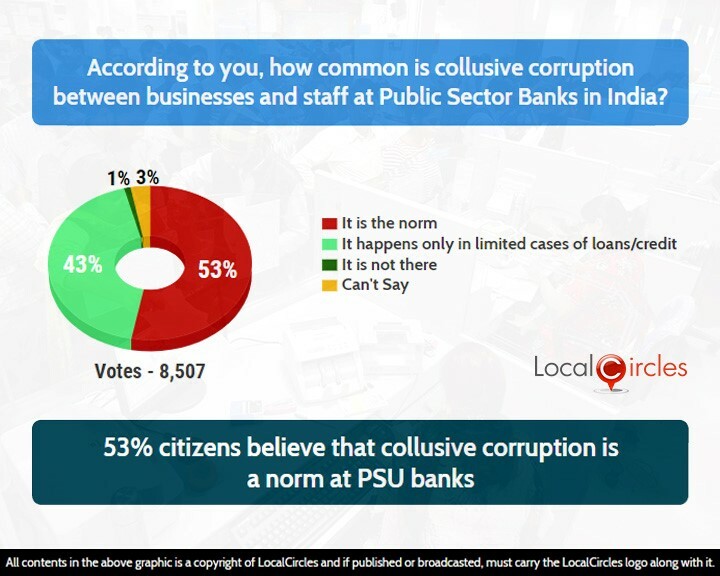 The first question asked citizens how common they think collusive corruption between businesses and staff at Public Sector Banks in India is. Around 53% said it is a norm and 43% said it happens only in limited cases of loans/credit. Only 1% said it is not there at all and 3% were unsure about it. 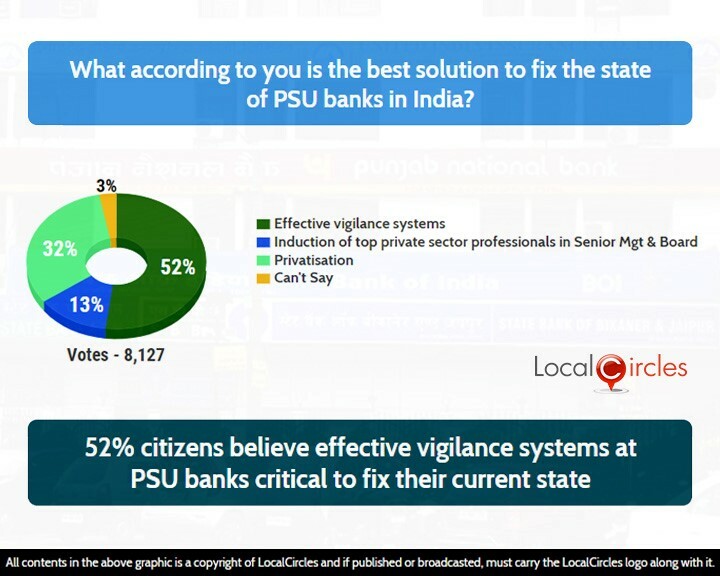 The second question was on what according to the citizens is the best solution to fix the state of PSU banks in India. 52% said it is effective vigilance system, 13% said it is induction of top private sector professionals in senior management & board while 32% said privatization is the way forward. The third question asked if a time bound, systematic external audit of loans and credit with common auditing standards should be done at all PSU banks to find any other fraudulent transactions in the system. Around 89% agreed with this and said it is a must, while 3% disagreed with it saying the $1.8 Billion fraud was more of an exception. 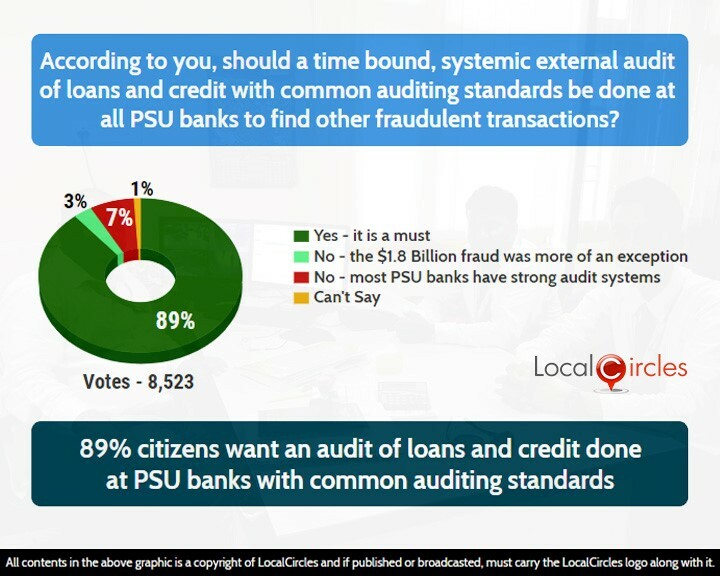 7% said it was not required as PSU banks have a strong audit system and 1% chose not to answer. The PNB fraud was committed using Letter of Understanding issued to other banks for import credit. Hence, a question was asked about the current status and risk type and should RBI demand an undertaking on it. 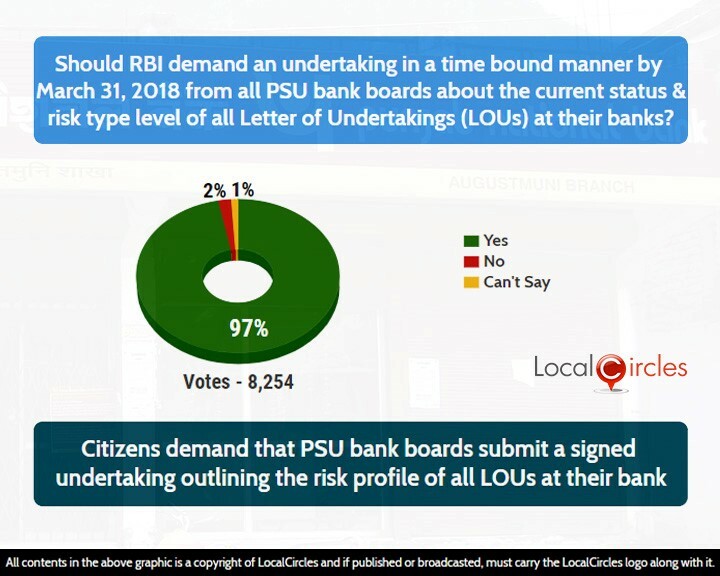 Around 97% citizens agreed that RBI should demand an undertaking in a time bound manner by March 31st, 2018 from all bank boards about the current status & risk type level of all Letter of Undertakings at their banks. Only 2% voted against it. 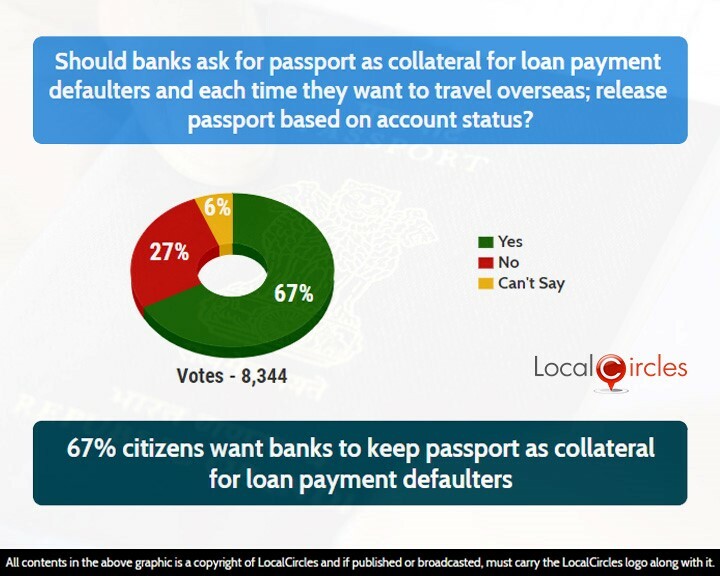 To prevent defaulters from escaping the law and fleeing the country a question was asked if banks should ask for passport as collateral for loan payment defaulters and each time they want to travel overseas, release passport based on account status. Around 67% citizens agreed with it while 27% did not agree with it. 6% were unsure. The general perception of frauds in banks is that it lowers the trust in banks. 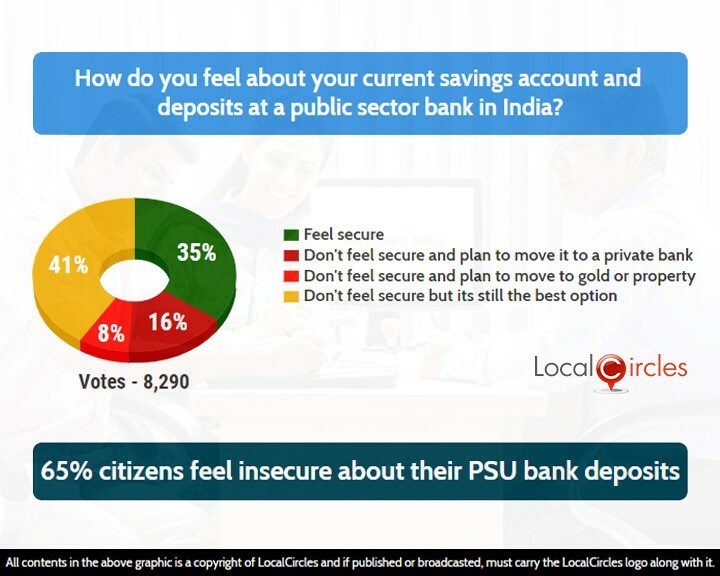 Hence a question was asked about how citizens felt about their savings account and deposits at a public-sector bank. 35% said they feel secure and 16% said they feel secure but plan to move it to a private bank. 8% said they don’t feel secure and plan to move to gold or property, whereas 41% said they don’t feel secure but it is still the best option. In discussions, citizens have also raised other areas of action like mandatory linking of SWIFT with Core Banking Systems by all banks, more attention and detailing of contingent liabilities by banks and more robust review by auditors. Some citizens also highlighted the need for high quality Independent External Monitors placed within the bank and given direct access to board as well as all customer and citizen complaints.